The Buffs then came back and cut the lead to 7-2, before Kavanagh posted her first goal of the game to put the Gators up 8-2. Colorado then scored two goals before the half, bringing the game to 8-4. Florida came out of the half firing, with Kavanagh picking up her second goal of the game just over a minute in to the second frame, extending the Gators’ lead to 9-4. The Buffs then picked up another goal, but Madi Hall was able to bring the lead back to five with her first goal of the season. Kavanagh once again found the back of the net, picking up her third goal of the game with 19 minutes remaining. She then tied her career-best with her fourth goal at the 16:52 mark, putting the Gators ahead 12-6. Colorado put two goals up on the board to cut the deficit to four, but it was all Gators from then on out. 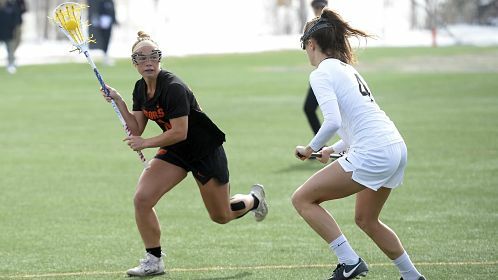 Haus added two more goals to her total, while Ronbeck and Brianna Harris helped put the game away for Florida with a goal apiece in the final 11 minutes. Florida held the Buffs to a 24% (9/37) shooting clip and forced 13 Colorado turnovers. The Gators are back in action on Thursday against No. 2 Maryland at Donald R. Dizney Stadium. Opening draw is set for 7 p.m.
“Overall, for our first game, we have a lot to be proud of because Colorado is an outstanding team. We definitely have things to work on this week in preparation for No. 2 Maryland. Opening draw is set for 7 p.m.
Join the Gators for Pet Adoption Day!